Arian Foster leads all RBs with +1.04 WPA, largely thanks to his 5.5 Yards Per Carry. He leads the league with 9 rushing TDs and 10 total, while avoiding fumbles in crucial situations. He’s also been solidly consistent, with a 54% SR. His EPA numbers are simply dominant at +49.2 EPA, as the next closest RB is Peyton Hillis, who has half as much with +21.2 EPA. Foster’s performance equates to 6 net point differential...per game. Hillis is second in the league, coming out of nowhere to lead the Browns to some unexpected success with +0.77 WPA. Kenny Britt tops all WRs with +1.30 WPA, but he’s out indefinitely with an injury. We’ll see how Randy Moss does in his place. What’s amazing is that Britt was only targeted 38 times. The #2 and #3 WRs in WPA have 51 and 88 targets respectively. Britt has been the deep threat for the Titans, averaging 19 yards per reception. 40% of his targets have been greater than 15 yards downfield. Britt is credited with 7 TDs, which means nearly 1 in 5 of his targets have been for scores. Lance Moore of the Saints is the runner up WR in WPA with +1.28, but Santonio Holmes is blowing everyone away in WPA per game, with +0.30 per his 4 game appearances this season. Wow-- His performance has lifted the Jets’ chances of winning each game by 30 percentage points, as much as the league's top two QBs! Most of his impact has come on only two plays. Holmes drew a 60-yard pass interference call to put the Jets on the goal line to win in their game against Denver, and he made a 52-yard catch in overtime to set up the game-winning field goal against Detroit. It should be no surprise that Antonio Gates is the top TE. He leads the pack with +1.24 WPA at a +0.16 WPA per game rate. His 9 TDs leads all TEs and ties Hakeem Nicks for the most for any receiver. Gates is first in yards per target with nearly 17 a pop. Vernon Davis ranks as the second TE with +0.94 WPA. Todd Heap is up there too. Davis, Heap, and Jermichael Finley (until his injury) are each posting +0.13 WPA per game. Through week 8, the top offensive line belonged to the Colts, worth an estimated +0.19 WPA/G. The runners-up are the Texans linemen, worth +0.15 WPA/G. Those are your WPA All Stars halfway through the 2010 season. WPA isn’t going to capture things like how QB A is doing with a mostly no-name receiving corps, how badly RB B 'wants it', or how brave WR C is for coming back from his horrific injury. That’s the job of the other 20 million football analysts out there. Man, and people thought baseball statistics would be tough to digest? Try saying Joe Flacco is #2 in the MVP race. Don't get me wrong, I'm a stathead, and Flacco is good, but that one almost blew my head up. I see the logic to it, though, which is more important than the output of the logic. Fixed. Where the heck did I get 'Patrick'? I blame my research assistant. Suppose QB A and QB B are on opposing teams and both start playing at the start of the 4th quarter. Suppose QB A leads his team from a 49 point deficit to a tie with 1 minute left in regulation (throwing 7 TDs along the way). If I'm interpreting correctly, this gives him a maximum of .5 WPA for the entire quarter up to this point, since the team's P(winning) is close to 0 at the start of the 4th quarter and < .5 with 1 minute remaining since they're about to kick off. Now suppose QB B's team has ran their RB on every play in the 4th quarter up to this point, and consequently QB B has added 0.0 WPA in the quarter. On the ensuing kickoff, the team of QB B has a such a poor return that their win probability is reduced to .5 (I assume this is possible if the score is tied with less than 1 minute left, even if QB B's team has possession). Suppose QB B passes on every remaining play in regulation, and throws a game-winning touchdown as the last play of the game. I assume this would earn him .5 WPA - more than QB A (and his 7 TD passes in the 4th quarter) has earned all game. How can you give so much credit to a statistic that tells us QB B adds more value than QB A? And please, let me know if I have made any misinterpretations of WPA. BTW, as an actuary who applies statistical concepts to real life problems everyday, I absolutely love the site and the original and innovative ideas you've generated. Do you think WPA could be improved by adjusting for the maximum amount of WP that a player could possibly add in a game? It seems to me that a player on a team that gets off to an early lead and stays ahead would have a harder time accumulating WPA than a player on a team that's usually within a few points of their opponent. Doesn't seem fair to players who help build and protect a lead. The definition of MVP is open to debate. But I think it starts and ends with who made the biggest impact. That's what WPA measures. It's not about who might have made a bigger impact in a different situation, or who had a better or worse defense, or who is likely to play better in the future. It's about who made the biggest impact. Actuary-Yup. It's all about the narrative. Just like a pinch hitter who hits a walk-off HR to win the game. He gets the WPA, and the MVP trophy. If you're looking to give the QB lots of credit for his ridiculous 7 TDs, then EPA is that stat you're looking for. By the way, .50 WPA for a single game is nothing to sneeze at. We could argue about this until the cows come home, but I’d have thought efficiency stats would be a better measure of ‘MVP’ worthiness. As good a measure as WPA is, it can be as much an indication of the rest of the team as it is that player. After all, at the start of each game you’ve got 0.5 WPA to win. If your defence is good and can take 0.2 of that then at most your offensive players are playing for 0.3. If you’re on a team with a poor defence then you could easily pick up far more than 0.5 WPA (and even then still lose the game). But, like I say, we could argue this all day. There’s no one definition of an MVP and every method will have shortcomings. One can easily argue, for instance, that efficiency stats are blind to game situation and it’s no good having a QB burning the defence all night only to end up throwing a dumb pick with the game on the line. Maybe a rotisserie type would work, so ranking QBs by WPA, EPA and efficiency stats and then taking the player who’s highest on the most lists. It’s not easy – but nice list to start with anyway. You wouldn’t want to face that team you’ve listed. Yeah, I can't see how anyone could take WPA seriously as an MVP measure. So a touchdown to open the game and a touchdown in the 4th quarter to take the lead should be valued massively different? They each had the same effect on a win, they just occurred at different times. If Foster got the 1st one and Andre Johnson got the 2nd one - didn't you need both to win the game? WPA is a nice tiebreaker stat to look at to determine value, but it is massively overvaluing leverage to make it the only stat. Of course it emphasizes high leverage situations. That's the point. It does not "massively overvalue leverage." It doesn't ignore plays early in the game. It just counts the high-leverage ones more. WPA values leverage exactly in proportion to the game situation. It captures the narrative, the comebacks, the drama, the excitement--the winning. Larry Fitzgerald has a 60 yd TD catch to take the lead in the SB. James Harrison had one of the biggest EPA plays ever. Who got the MVP? Santonio Holmes, who had a great game, but only won the award because of 3 huge WPA catches to come from behind to win. You can think of WPA and MVP-ness this way: Which player's performance, if replaced by an average performance, would hurt his team the most? That's exactly what WPA is measuring. 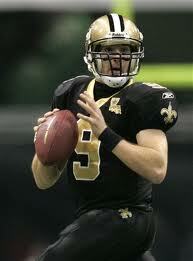 Drew Brees is a great example. The Saints are 6-3. Replace Brees' 2.6 WPA performance with that of a 0.0 WPA player, and you would most likely see the Saints at 3-6 or 4-5. The Texans are 4-4. Replace Foster's 1.0 WPA with an average performer and Texas would likely have a 3-5 record. The guys who are trying to poo-poo WPA as an MVP measure either don't understand it, or are just going out of their way to be critical. Writing things like "hard to take seriously" or "massively overvalues..." is transparent. You are free to use whatever stats you like. If you want to count up touchdowns and yards, you can always just look at fantasy points. Brian, I'm wondering if WPA doesn't actually underweight leverage compared to the completely unknowable formula used by MVP voters. WPA accounts for everything, including subtle plays that contribute strongly to winning but don't end up on SportsCenter, while voters are very strongly swayed by just a few obviously high-leverage situations. How does WPA rank do in predicting MVP outcomes over the last decade? Drew Brees is the most valuable QB according to these stats and Flacco is number 2? Doesn't that pretty much tell you that those stats are worthless? These stats are really flawed... especially because they seem to use team wins as a way of measuring individual players. I guess you can't do much worse than sportswriter voting though when you try to choose an MVP. I'm really a stat guy, but Peyton Manning is the most valuable QB in football and its not even close. Does WPA measure pre-snap reads? Does it account for how valuable it is when the QB audibles into a run that gains yards/TDs because how the defense lined up? Football is too complex of a sport to even make these individual measurements in. Everything is dependent on something else, not to mention the countless other factors including luck/randomness. I applaud your efforts though. "worthless", not nearly as worthless as some Indy homer named KittenMittons with his super-scientific Manning is the best crap. Patrick Willis. That's where you got it. You may well be right about Peyton overall, but that's not that we're measuring here. We're talking about the most valuable player over the first 8 games. The idea is to discount everything else we know about players and judge them only over these 8 games. Manning's certainly up there (leads the way on EPA for QBs after all) but those points haven't been in high leverage situations. I don't mean to criticize what you do here too much, Brian; you know I'm a fan and I really enjoy the stats here. But I feel like you've gone way to far in relying on WPA as a means of evaluating individual players. Say Peyton Manning goes out and leads a scoring drive on the first possession of a game, and the next, and the next, while the other team goes three and out each time, until the game is out of reach. Say every positive play is a passing play, and he completes every pass with a 100% success rate for the day. What will his WPA be for that game? Something in the neighborhood of .3 or .4 WPA, I expect. It's strictly less than .5 because WP starts and .5 and, in this case, monotonically progresses towards 1. The defense will get a lot of credit on those stops, so something in the .35 range is probably where he ends. Meanwhile, there are INDIVIDUAL PLAYS late in games that have a similar level of WPA impact to that entire, idealized "perfect game". 1) It is extremely context dependent. It's extremely hard to argue that the "perfect game" I describe above should be valued less highly than a see-saw 4th quarter shootout where both QBs pick up a ton of positive WPA. Yet that's precisely what WPA will do. 2) It is fundamentally descriptive, not predictive. While "this player was involved in more positive critical plays than anyone else" is one way to define "value", it's not a particularly meaningful way, in my opinion. I would expect that EPA/game is a better predictor of future WPA/game than WPA/game is, which tells you all you need to know about it as an individual stat, in my opinion. 1) Just use EPA (when evaluating players' seasons). The top four for EPA is Manning, Rivers, Brees, Rodgers. Foster is blowing away the pack in RBs. That list passes the gut test much better than the WPA list. 2) Make a hybrid stat that scales EPA by WP context. For each play, take the higher of WP before and after the play. If that value is between, say, 15% and 85%, use the full value of EPA for the play. If the value is outside that range, then use a decay function to reduce the EPA. Basically, this is EPA with garbage time discounted. 3) Convert WPA into "win shares". For any given game, calculate the total WP movement over the game. Then divide every play by that total movement. So, there's a total of one "win share" available for every game, and it gets divvied out amongst the plays. Winning a blowout no longer limits your WPA vis-a-vis a seesaw game. "Drew Brees is the most valuable QB according to these stats and Flacco is number 2? Doesn't that pretty much tell you that those stats are worthless?" As opposed to the conventional wisdom that Drew Brees "holds the belt as the greatest QB" [Simmons] two months ago, but now he suddenly is not a good QB? Or the conventional wisdom that says that Flacco can't lead his team back from behind when he's done it four times this season? If you ask me, not being able to account for reality is a pretty good definition of worthless. "especially because they seem to use team wins as a way of measuring individual players." You know, just like the MVP voters do. Was Brees even in the discussion when his team was the 'Aints? "Does WPA measure pre-snap reads? Does it account for how valuable it is when the QB audibles into a run that gains yards/TDs because how the defense lined up?" A) No stat could ever do this to your satisfaction; you don't want a stat, you want John Gruden. B) WPA measures the "intangibles" [obviously, it can be measured, ergo not strictly "intangible"] of a players' performance better than anything else. C) WPA does not overvalue such contributions like John Gruden would. All this said, I would be intrigued by "WPA Conversion Percentage" or something similar that accounted for opportunity. Alas, I imagine it would be uber-hard to calculate and may not even tell us anything different/significant. Fun. We can add a new argument to the already existing zillion over what should determine "MVP"! My take: The most valuable player is the one who actually did the most to win the game(s), not the best one you'd expect to win the most games going forward. When I was a kid in the last century loving the Miracle Mets, one of their miracles was winning a swing game in the World Series against the big bad Orioles when little all-field no-bat shortstop Al Weis, with his Interstate BA, smacked one over the center field fence. *He* was the MVP of that game. Though if I'd been a GM choosing up sides among those players he'd have been about my last pick. Since doing the most to win a game makes one the most valuable player in it, top WPA = MVP, IMHO ... even though EPA or success rate may be a superior indicator of who is the best player who will contribute the most to winning games going forward. It's not entirely unlike looking at the league's championship team versus its best team. Looking back, the championship team isn't always the best -- though going forward the best becoming the champion is the way to bet. WPA is a retrospective stat, EPA and success rate are predictive stats. Maybe the player with the biggest WPA-EPA gap should earn a title of his own: "Mr Clutch" or "Mr Lucky", and the reverse. "Flaw" #1: WPA is very context-dependent - just like you want the performance of your players to be. Of course, you would prefer for them to just be dominant, but if I have Joe Flacco and not Peyton Manning, then I want Flacco's performance to peak in high-leverage situations. "Flaw" #2: Of course, this does not prove to be very repeatable. Brian says all the time that WPA is a "different tool" than EPA. He has uttered many times that WPA is not predictive. While I take the point about the 'perfect game', the game you describe results in a massive blow-out. Typically, massive blowouts are against poor teams when pretty much anyone would put up big numbers. In my mind, you judge the best players by how they do against the best, not how they do blowing out the NFL equivalent of Division II teams. I agree, but it's not about player evaluation. It's about the story. WPA isn't interesting in who "is" the best, whatever that may mean. It's about who actually made the biggest impact. I think Peyton Manning may be the best quarterback to have ever lived, and his career WPA numbers back that up. His most recent 8 games just haven't been among his best. This really isn't a debate about WPA. WPA measures exactly what it is meant to. It's a debate about how to define MVP. Jeff, I certainly don't consider you a troll, even if I've been reading and commenting here since 2007 ;). Yes, it would be awesome if Flacco is, in fact, better in high-leverage situations than the rest of the time. However, since you're challenging my conjecture that this is more of a descriptive than predictive stat, then we should be able to agree that's not really what we're seeing. All we're seeing is that Flacco WAS very good in some high-leverage situations. It doesn't even mean he was good in all or most key situations - leading a comeback from a 15% situation once and throwing a game-ending interception three other times is worth +40%, after all. Flacco's great performance in the clutch has been a function of his innate talent, opportunity, and random fluctuation, as opposed to some ability to excel beyond his talent level in key moments. This really gets to the key point, as I said in my earlier post. Note that I sad "is", not "was" in the paragraph above when describing Flacco. Flacco WAS very good in clutch situations so far this year, but that is where it ends. Even if we grant that we are in a completely context-driven and descriptive analysis, I STILL reject the notion that WPA is the best measure to go by to figure value. Something like the "win shares" I mention above seems far more meaningful, because it actually measures how much of each individual win a player is responsible for. Here's a thought experiment for you. Say there was a wide receiver who had two positive plays all season, but both were Favre-to-Rice-to-beat-the-49ers-in-2009-level plays. My hypothetical player would currently be leading all WRs in WPA, even if they also had a bunch of drops and fumbles, too. Does that sound like a good descriptor of overall value? To me, it doesn't. I think equating WPA with value in an MVP context is a bit silly, really. It's a tool, but it's a tool to describe plays, not players. Brian, I think we're on the same page on all the theory here. And since WPA correlates strongly with EPA in the long run, it's no surprise that Manning has amazing career WPA. But like you say, WPA tells a story, and it's the story of the ebb and flow of a game. I don't think this is a good measure of either our gut instinct of what an MVP is, or even a particularly good measure of who has made the most plays that have resulted in wins. It measures who has done the most with the most leverage over a relatively small sample of one year. As I've said a couple times to the others, I would love to see WPA scaled by total WP movement in each game, to give us a "win shares" stat. I guess this would just be WPA/EI, right? This seems like a more accurate indicator of "who has done the most to deliver wins" than pure WPA. On the "what is an MVP" question - I think even the Raheem Morrises out there instinctively place some weight in stats that are predictive, as opposed to just who wins. We want MVPs that deliver consistent positive performance, not just somebody who's involved in few Favre-to-Rice plays. Well, I doubt that anyone will become NFL #1 in WPA on just a few lucky plays. But the "MVP argument" will never be settled until there is an agreed definition of MVP. It can be hard to agree on even just who is a better player without first defining "better". As Bill James said 30 years ago about the endless "Mantle-Mays" arguments, it depends on whether the better player is the one who had the best top seasons (Mantle by a lot) or who produced the most over a career (Mays by a lot). Without definitions arguments are endless, which is a lot of the fun. Anyone want to talk about who deserves to be in the Hall of Fame? 1) Players on winning teams. 2) Players who perform well in the clutch. 3) Players on teams with mediocre defense. These three categories are exactly what offensive WPA measures best. Last year is a good example. Manning and Rivers were practically identical in EPA, but Manning's WPA was far better due to his multiple 4th-quarter comebacks, which would not have been possible without a mediocre defense to put him in those high-leverage situations. Rivers is in a similar situation this year to what he faced last year. He is putting up historic numbers, but his defense is snatching up a lot of the WPA, and there is no way he will win MVP if the Chargers don't start winning, something that is directly measured by WIN probability added. If the argument is that we want to measure who did the most to win the most games, then I think it's tough to argue that WPA accurately captures that. After all, you can pile up more than 50% WPA in a game (remember, you started with 50%) if it has big swings or a tight finish. More to the point, you can pile up a lot of positive WPA in a loss. Of course, you can counter that by saying "yes, but those good plays in the loss gave the team a chance to win". But the Raheem Morrises can just say "that doesn't matter if you don't win". And statheads like me can say "if you're interesting in who does the things that give you a chance to win, irrespective of the actual results, then other stats are better". I don't think I have much else to contribute except to say that I am not "challenging [your] conjecture that [WPA] is more of a descriptive than predictive stat." I am agreeing with this point and saying that's what the stat seems designed to do. MVP voters don't seem to care whether the performances they have witnessed are repeatable. In my [brief] lifetime, Rich Gannon and Shaun Alexander [both of whom I like as players, don't get me wrong] have had more or less "one-off" seasons and won the MVP in those seasons. One thing I do know is that this comment thread has some MVP commenters--Tarr was probably one of the first regular readers here. Jim Glass. bmoore. Ian. MVCs all. Jeff, yes, sorry, I meant to put a "not" in that comment, but it got left off. I was aware you weren't challenging that notion. As far as the MVP goes, I don't really have a problem with a one-season wonder winning the MVP - I actually prefer that to someone winning because we think they're the better player. I'd just like the emphasis to be more on performance than team outcomes, although I'd have a hard time giving the MVP to a player on a 4-12 squad. Brian, thanks for the shout-out. It's been a great place to hang out. Flacco goes 5 of 7 for 70 yards in 1:52 to put his side in the lead with 1:05 left. That sounds like the kind of performance a potential MVP would put in - shame his defense let him down and the drive wasn't a game winner. I actually wrote that before the Falcons went the other way and got the win. But this is actually, now, the perfect example of why I feel like WPA is an odd way to measure individual performance. Flacco did (belatedly) put in a massive performance in a high leverage situation last night, but he gets a zero from Raheem Morris for his effort. If all that matters is winning, then Flacco didn't do anything good. If, on the other hand, we like his performance because it had lots of quality and is the kind of thing an MVP does, then you're really talking about the repeatable value you can expect from someone who plays that way. And EPA is a lower variance, more reliable measure of that than WPA is. Well I actually disagree on the need for 'repeatable' performances to make an MVP. If you do something special then you should be credited, whether you can do it again or not (I'm thinking 108 yd FG returns here). Thus, we end up at an apparent disconnect. If you ask for the best player, I'll look at EPA and efficiency stats, because your question implies you want to know who'll be best going forward. If you ask for the MVP, I'm happy with WPA because I'm only interested in who did well, not who will do well. A subtle, but significant difference. "What makes Flacco's performance in the late 4th quarter scoring drive so much better than a similar drive earlier in the game?" Remember, "because they won" is not an acceptable response, because they didn't. By the way, EPA doesn't discount unrepeatable plays like 108 yard returns; it just doesn't make them more or less valuable depending on the score in the game and the amount of time left. Tarr - That's a great question and really there's no great answer, but let me try to justify it. It gave his team more of a chance of winning than had he done it earlier but you also have to consider the other side, if he fails. If he doesn't drive them the distance earlier in the game, it doesn't cost them the game. To use the cliché, the stakes were higher. Hence why 'The Drive' is so huge in folklore. But I can easily see the other side of the argument though. Why should a player be rewarded just because he performed well late on, when if he's just done that earlier in the game he probably wouldn't have needed the late game drive. Like I say, it's not a great answer, but as I see it there's two schools of thought here and neither of them has got a killer reason why that way is best for MVP awards. Why should a player be rewarded just because he performed well late on, when if he's just done that earlier in the game he probably wouldn't have needed [to]? I don't know, but we might ask Adam Vinatieri. If during the 2003 Super Bowl he hadn't missed FGs from 31 and 36, his Wikipedia page couldn't call him "Automatic Adam", "the Iceman" for winning the game by hitting one from 41 as time ran out. So it's worked out for him. Hence why 'The Drive' is so huge in folklore. People forget that before 'the Drive' Montana threw three picks to put his team behind, so it worked out for him too.